In our book, the same route is always different - no matter how many times it is walked. "The Triangle" is one such route: first recommended by a friend a few years ago and walked many times since, in all seasons and in all conditions. Appropriately, it's a three-sided walk near Kingswear in our native Devon; a mixture of country lanes, a couple of footpaths and a gravel track bordered by hedgerows. It's reasonably flat and we always go at a leisurely pace to see what things we can see. And some years, it's been the first port of call to see the flowers when spring has sprung. 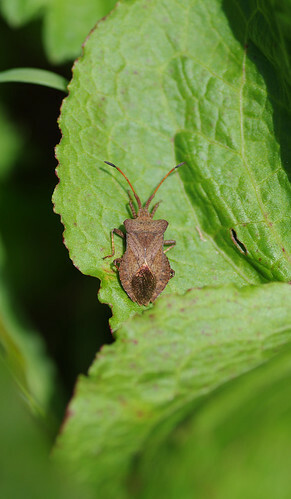 By returning to the same hedgerows, we have learned to distinguish a few more species every year. At this rate we might almost become a pair of accomplished botanists - give it another half a century or so. First up on the list of species spotted was this hornbeam, almost tucked away amongst a beech hedge. 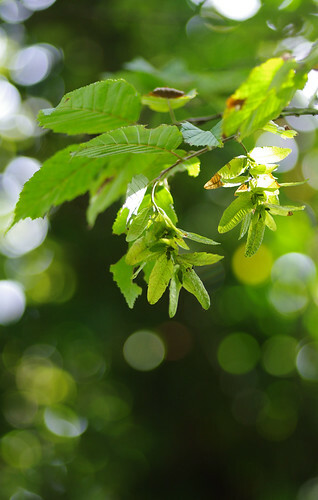 Traditionally, the hornbeam tree was coppiced for the hardness of its wood. Sherry noticed the different leaves and began to get some good shots. The 100mm Pentax macro lens really excels shooting up and into this light; producing a pleasing bokeh. Then, as gravel track became country lane, we walked through the outskirts of Kingswear, with stunning views of Dartmouth Castle over the other side of the Dart estuary and teasing sections of the coastline towards Start Point. 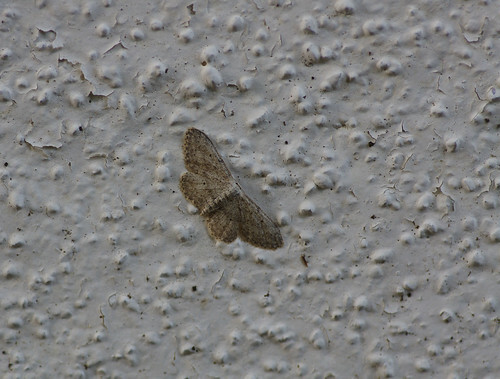 The white walls of buildings are often an excellent place to look for moths, even if the search to identify them afterwards proves unsuccessful! Our route then took us away from the village and up through a small wood. 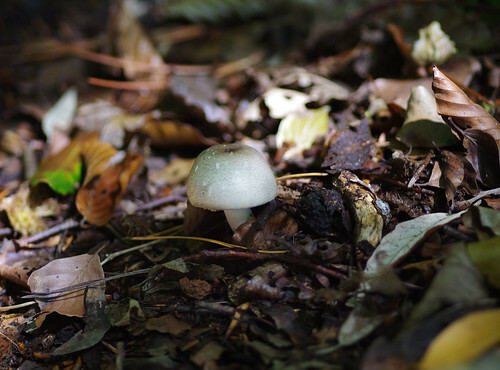 Sometimes the leaves on the ground obscure fungi. Sometimes the decomposing matter seems to activate the fungi to sprout up. And usually we're left wondering what on earth it is, particularly when the same species is capable of going through several stages of development: rounded at first until finally flattening out. Of course, every specimen is different, as a quick perusal of Roger Phillips's Mushrooms proves. And the light is critical; harsh use of the flash can whiten everything and make everything appear unnaturally bright. This is one major criticism of photographic field guides. They often show a single species as far brighter and lighter than it would appear on an overcast day. Sherry waited until the sun was slightly more shaded to capture the insect above. At the end of the small wood, we walked along another lane and then paused to have our lunch on a picnic bench in a primary school playground. It being a Sunday the place was utterly deserted. It was also a propitious place to stop: no sooner had we sat down than the find of the day came crawling our way! 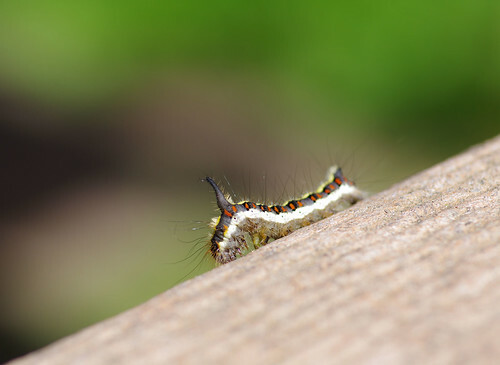 The caterpillar continued to move along the bench while we ate our lunch. Afterwards, Sherry moved it to the grass just inside the fence. As I write (about ten days after our encounter - and in the evening to boot! 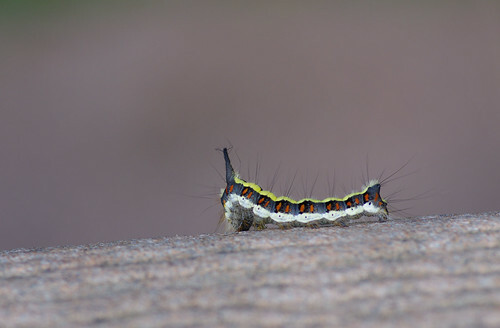 ), I hope this creature is flying around somewhere, possibly even passing over the same bench!